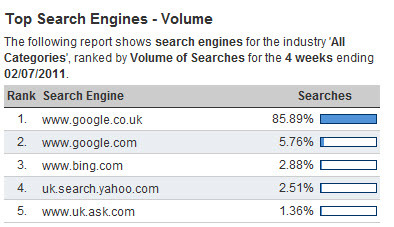 It has been forever since i posted about search engine market share in different countries. It’s not really rocket science or anything. I just feel that if you work in search engine marketing industry, it would be good to have an idea on which part of the world Google, Yahoo, Bing, Baidu and other search engines claim their dominance. 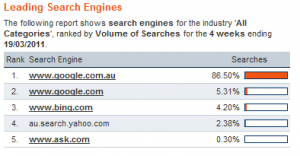 Edited: Sept 2015, the updated stats for Search engine market share in APAC are here. My latest ebook on “Search Engine Marketing in the mobile age” is published here as well. If you want to look for details, refer to the below sections. 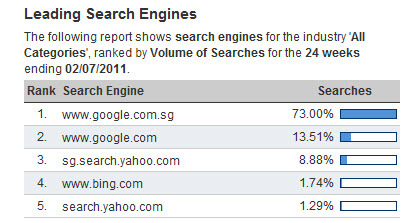 Updated 09 Jul 2011, Google leads the way with 65.5% share of the market place, followed by Yahoo (15.9%), Microsoft (14.1%), Ask (2.9%) and AOL (1.5%). 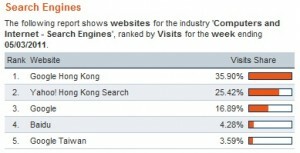 For more information, please refer to the press release by comScore about Search Engine rankings. Google dominates most of the European countries except for Russia where Yandex remains the leader with substantially higher market share (about 64% share in Russia). Yandex is preparing for its IPO as well so we will see lots of news about Yandex this year. 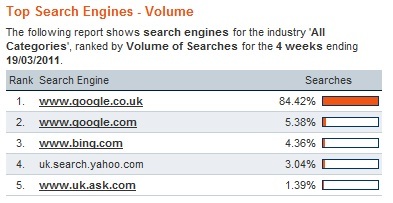 Simple calculation shows that Google has 89.8% of the market share in terms of search volume according to Hitwise. Well after the public “event” between Google and Chinese Government that led to the redirect of all Chinese Searches to Google Hong Kong, Google has experienced the declined market share in China. Baidu is gaining momentum at rapid rate. According to to research by Enfodesk, Baidu search market share reached 75.5% in Q4 2010 while Google’s market share fell to below 20% level. At this level, advertisers will have an option to just go with one search engine for China market only if they want. While there is little doubt that Google audience and Baidu search audience are different, the gap is quite indistinguishable now. 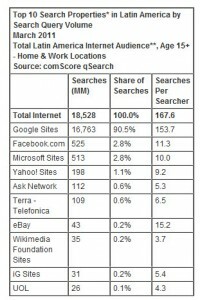 Yahoo used to own the search market place in Japan with more than 51% of the search market share, followed by Google with 38% in 2009. However in Jul 2010, Google Japan and Yahoo Japan announced a partnership in which Yahoo Japan would use Google Search Engine technology instead of its own. This is applicable to both organic listings and sponsored listings. This simply means Yahoo admitted that its search technology cann’t compete with Google in Japan and Google natural listings are of better quality. It’s unclear at this point whether Japanese would slowly move from search on Yahoo more often to searching on Google because while Google in Japan is primarily a search engine, Yahoo is a portal and people go to Yahoo not only because they need to search for information. Edited 01Aug2011: from the comment of one of the reader Ivo Wijnbergen “Seeing as Yahoo! is partnering with Bing globally and therefore will terminate their own platform, perhaps Yahoo Japan had no other option as to go with Google´s technology. Bing doesn´t have a platform in Japan and I see no information that they´re going to build one there. Well i would say there are always two sides to a coin. 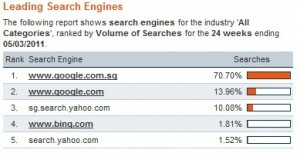 From the picture above, we can see that, Google Hong Kong and Google.com has 52.7% share of the Hong Kong search market. 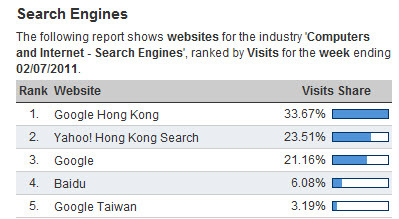 Google Taiwan has another 3.59%, which is interesting to see. One would need more information to explain such high percentage but the fact that both Hong Kong & Taiwan use the same Traditional Chinese, Popularity of Taiwanese culture in Hong Kong. Hong Kong used to be the gateway for Taiwanese to travel to mainland China. However, after the direct link the number of Taiwanese travelers visiting mainland China via Hong Kong dropped by some 20 percent. Yahoo has 25.42% of the share. 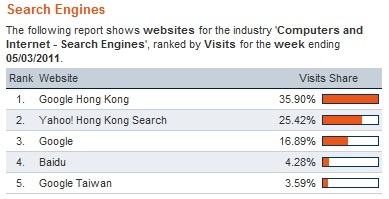 This is quite embarrassing for Yahoo Hong Kong really because just 2 years ago, they dominated the market. Updated Jul 2011, all Google sites now has 58% of the market share in terms of visits as compared to 23.51% for Yahoo according to Hitwise Hong Kong Search Engine market share data. 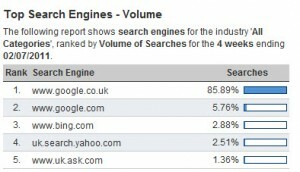 Google solidifies its position with 86.51% of the market share, followed by Yahoo and Bing. Updated Mar 2011: The battle between search engines was over in Singapore in 2010. Google now has 84% of the market place. Local search engines are insignificant in Singapore, which is already too small for Google, Yahoo or Bing. In both countries, Google is the clear leader since 2009. In Brazil, Google has more than 89.5% share of the search market. Not only that, its social networking service Orkut is the number one in Social networking sites, with more than 29 million unique users. Facebook only ranks number 3 with more than 8 million unique visitors per month in Brazil. 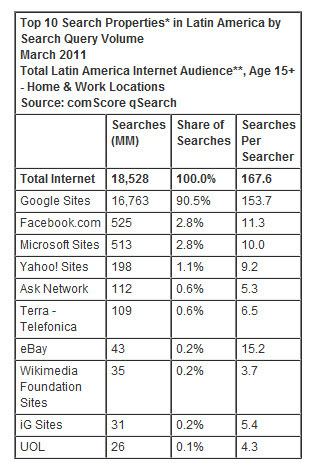 Google has more than 88.4% of the search share in India as well. The situation in other countries like Australia, New Zealand, Vietnam, Malaysia, Indonesia, the Philippines, Thailand remains unchanged. Google is clearly the leader and we don’t see anyone is coming to challenge Google. Yahoo has enough on its plate trying to figure out English-speaking countries. Its capability to understand local languages other than English is extremely limited as compared to Google. If you have any added information, feel free to comment here. As shown in the picture above, Google commands 81.57% of the market share, Bing and Yahoo follow with 8.6% and 3.75% respectively. Updated 04 Apr 2011: The above data was taken from Hitwise, please refer to the top websites and search engines from Hitwise Canada. 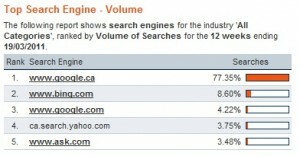 Update May 17th, 2011: According to comScore, Google has 90.5% of the market share in Latin America. The absolute volume of search queries in the region grew 21% over the same period last year, Mar 2010.
first, great article thanks a lot! Second, I would like to know where did you get those stats, I know you say that for USA you took comscore stats, is it the same for Canada? I need the marketshares of the different search engines for Canada, you have told me exactly what I need, but I can’t use it if I don’t know where it comes from. Just came across your blog as I was looking for Search Share data. Regarding your comment on Yahoo! Japan admitting that their technology can´t compete with Google´s in Japan, I think you´re drawing the wrong conclusions. Seeing as Yahoo! is partnering with Bing globally and therefore will terminate their own platform, perhaps Yahoo Japan had no other option as to go with Google´s technology. Bing doesn´t have a platform in Japan and I see no information that they´re going to build one there. So my impression is that they went with Google tech as this was the only feasible option left. That or building their own, which is of course very costly. Regarding the portal usage, that is the main point in Japan I think. Yahoo! has some 90%+ share in portal, so that helps their search share significantly. Thx Ivo for the comments. What you said make sense and i am making changes to the original post to reflect that. 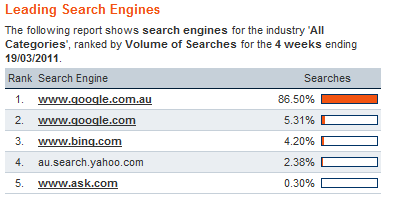 Also stumbled across this blog when trying to work out share of Japan market for Yahoo JP and Google JP URLs. Chandler is right and what you must remember Ivo is that Yahoo JP never actually belonged to Yahoo in the same way its other portals did. Yahoo is actually a minority steak holder in Yahoo JP so the Bing-Yahoo partnership never really effected Yahoo JP. 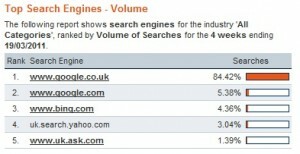 The decision to move to Google SERPs was on the cards way before Yahoo/Bing merger simply because SOFTBANK wanted to. It was a business decision by them (the majority steak-holder) rather than Yahoo’s failure. Wow! Very detailed post about “market share” . Thanks for sharing this nice post.. This is really very unique post on this topic. Keep it up!! Wow! !good thanks for sharing this useful information.